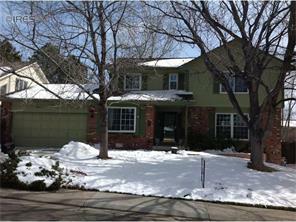 Wonderful home in Cherry Creek Vista. Located on a quiet street with great curb appeal, mature trees and landscaping. Updates throughout, hardwood floors, fireplace, skylights, all new windows, main floor laundry and four bedrooms on the upper level. This home has a great floorplan, warm and inviting. The backyard has a covered deck, sprinkler system and plenty of room to play! Love Where You Live.